I just had a chance to do a test run with the Blender V3. 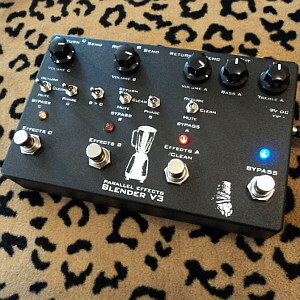 I am a guitarist and wanted to blend two different distortion pedals with EQ. In a matter of minutes I had a much better sound than any of the pedals on their own or in line (series) with each other. I am very happy to have found this company and this product. This pedal is also solid inside and out. I pulled the cover and the wiring is immaculate. I highly recommend it.